Laurie Jugan is a leading innovator in the commercialization community. She is an independent consultant currently supporting the University of Southern Mississippi through the Mississippi Enterprise for Technology at Stennis Space Center and USM’s contract for the formalization of the Marine Industries Science & Technology Cluster. She promotes the Blue Economy of the Gulf Coast region, coordinates events and assists small to medium-sized companies find business opportunities. For MSET, Jugan serves as a program manager, developing and conducting programs that link technology providers with organizations that can apply the technology to their missions. She is well-versed in government contracting and the technology transfer process. 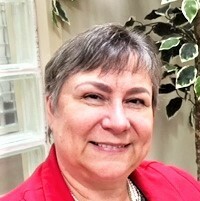 She routinely provides guidance to companies as they navigate through the processes of various federal agencies and identifies business opportunities for companies based on their products and services. Hank Torbert, a founder of The Frontier Conference, interviews her about advances in the industry. I have both a technical and a business background, the combination of the two has served me surprisingly well in my current, second career. I have master’s degrees in oceanography and business management. I worked for a small technology company for 25 years. As you know, in a small company, people have many hats. My hats ranged from conducting research to running a cost center and writing proposals. I’ve held almost every position there is in a small company (never was an owner or president), so I can relate to the issues companies face. Currently, I help companies navigate through the nuances of federal contracting, tech transfer, and working with other companies. Yes, these are traditional industries in the Gulf region that have developed mainly as a result of strong leaders in the area. In aerospace, that leader is NASA. When you have a big name like that, it attracts others in that sector.In manufacturing, innovation has been more university-led, with universities like Mississippi State taking on education/training roles to support these industries. Can you share some of Mississippi Enterprise for Technology initiatives? What are the key areas for innovation? What are the focus sectors? MSET is currently entrenched in a whole new look at the Gulf coast economy that focuses on the water asset. This “new” industry, which we are calling the Blue Economy, might even be an addition to the Frontier Conference in years to come. Key innovations in this sector include the use of autonomous unmanned systems. Initially affordable by the Navy and oil & gas industries, we are now seeing smaller, more agile systems being developed for entirely new applications. First, we are seeing more new startups that focus on advancing a technology. These range from the one-person operation to those that skyrocket to over 250 employees. In this case, inventors are coming up with new designs that take a capability to a whole new level. Second, technology insertion creates new jobs – for example, the Navy at Stennis will be looking for perhaps hundreds of new employees to support their fleet of underwater gliders in the next three to five years. No Replies to "The Frontier Series: How an innovation economy helps create jobs"